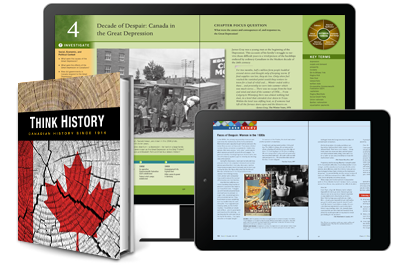 Think History is a new resource written for the Grade 10 Academic Canadian History Course in Ontario. This resource is designed to engage students through a focus on big ideas, along with a variety of visuals, relevant stories, and features that will encourage critical thinking and inquiry skills development. Think History moves history teaching away from a focus on memorizing facts and dates to helping students and teachers use inquiry and historical thinking as they explore key people, places, and events in Canada's past.